Trump’s Attorney General nominee William Barr is testifying before the Senate Judiciary Committee. It is scheduled to continue through Wednesday. Host of the award-winning “Flashpoints News Magazine” on Pacifica Radio, Bernstein covered the Iran-Contra scandal extensively. At the time, he was co-host of the program “Undercurrents” and his writings on the subject were published in Newsday, Spin and other outlets.He said today: “Many have speculated about Trump using the power of the pardon to help cover up his own criminal activity. That is exactly what Barr advised and supported regarding the pardoning of the key Iran-Contra criminals, who threw the Constitution in the garbage and conspired with drug traffickers and terrorists to overthrow the Sandinista government throughout the 1980’s.”Indeed, there’s been far too little attention paid to Barr’s actual record while attorney general in 1992, when he approved of then-President George H. W. Bush’s pardons of Iran-Contra criminals Caspar Weinberger, Elliott Abrams and Robert C. McFarlane. Barr also worked at a time for the CIA, including while Bush was CIA director. “It’s remarkable that Barr is up for attorney general again after helping facilitate the massive criminality of the Iran-Contra scandal. 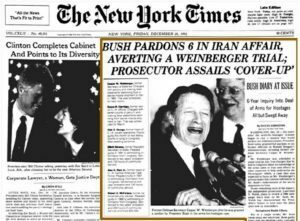 Background: Consortium News founder Robert Parry, who broke much of the Iran-Contra story would later write in “Firewall: Inside the Iran-Contra Cover-up“: “The Republican independent counsel [Lawrence Walsh] infuriated the GOP when he submitted a second indictment of Weinberger on the Friday before the 1992 elections. The indictment contained documents revealing that President Bush had been lying for years with his claim that he was ‘out of the loop’ on the Iran-Contra decisions. The ensuing furor dominated the last several days of the campaign and sealed Bush’s defeat at the hands of Bill Clinton. See Walsh’s book Firewall: The Iran-Contra Conspiracy and Cover-Up.